Our second annual “This Place Matters” Photo Op took place at the Lilly Weston House on Wednesday May 23rd, at 7:00 pm. “This Place Matters” is an awareness campaign championed by the National Trust for Historic Preservation to celebrate National Preservation Month in May. Our first "This Place Matters" photo, found at the top of our home page, was taken in 2017. 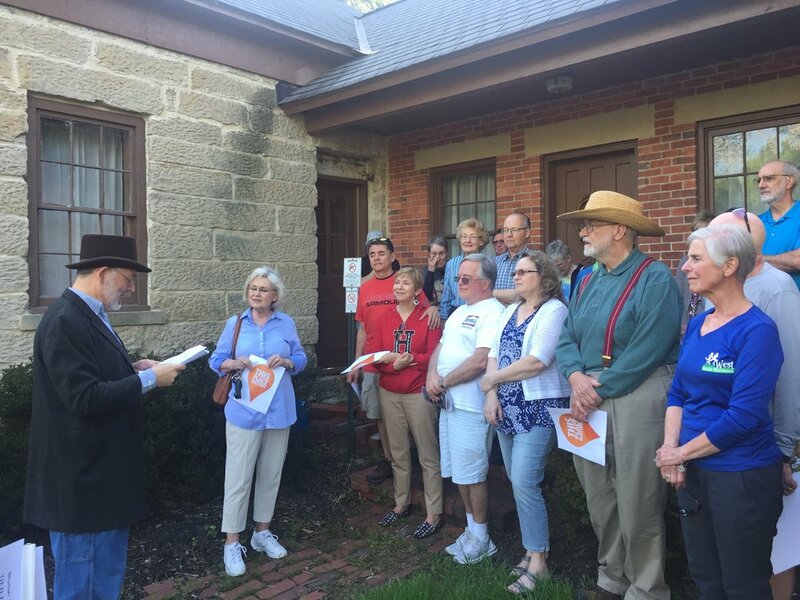 After the photo was taken, Westlake Historical Society Board Member and Lilly Weston Committee Chairman, Will Krause, addressed those in the attendance about the importance of this historic resource and its restoration. The notes from his talk are presented below. Thank you all for being here. It is our chance to say that this humble stone cottage matters. It is part of our daily lives driving by. If nothing else it is a landmark that helps us find the Recreation Center drive, but hopefully in the near future it will be much more. It lets us know that we are in Westlake, near the center of Westlake. An area settled by New Englanders 200 years ago. It reminds us they were mostly farmers. It reminds us we live in an area that has building stone and clay for bricks as natural resources. It reminds us that we have come a long way from these humble beginnings. Austin Lilly was a farmer who apparently was a builder on the side. He built the first schoolhouse in Dover Center, he provided shingles for one of the first churches. His brother Jesse owned land where Bradley Woods Metroparks now has a quarry trail, so almost certainly this stone came from his brother’s quarry. Austin Lilly died young, just a year or two after building the stone part of this house. His widow Roxanne and son Albertus built the brick wing shortly before Albertus married Mary. Mary and Albertus sold the house to George and Rhoda Weston. George and Rhoda sold off some of the land to German farmers who built many of the century homes we now see on Bassett Road. The Lilly and Weston families went on to do many great things in the community. Mary Lilly founded what is now known as Wesleyan Village for Seniors in Elyria. The Weston’s went on to become Dover and Westlake leaders in education, local government, history and aid to the poor. For those who don’t know me I am Will Krause, Asst. Planning Director for the City of Westlake, Historian and Board Member of the Westlake Historical Society and local history writer in the Westlake Bay Village Observer with my column “Digging Dover”. I am the current Chair of the Lilly Weston Committee which is a committee made up of Historical Society members and city administration who have been meeting monthly to move forward the transformation of the Lilly Weston house into a museum of early Dover history, for most especially the children who will be able to walk across Center Ridge Road from their new elementary school. Thank you Austin, Jesse and Albertus for building a solid building that will outlast any of us here with the proper care. Thank you Alden Presler, former owner of this house for being one of the founding members of the Westlake Historical Society and preserving and loving this house for many years. Thank you Alice Ladanyi, Weston descendent for having the foresight to purchase this house and donate it to the city. Thank you Mayor Clough and City Council for being willing to accept the donation and set aside the initial $50,000 to stabilize and preserve it. Thank you Westlake Service Department for doing much of the initial stabilizing work on the structure and maintaining the property around it since 2000. Thank you Historic Preservationist Steve McQuillin for chairing the Lilly Weston committee for many years and getting the house on the National Register. Thank you Dr. Jim Anderson for spearheading the initial fundraising for the house and tending to it when no-one else seemed to care. Thank you Lysa Stanton, Society President for the mantra “clean, safe and dry” which has helped direct our efforts and for the initial idea for this event last year. Thank you Eagle Scout Noah Furin and Chris Stuhm, Service Department Deputy Director and Engineering Director Bob Kelly and Recreation Director Bob Deminico for helping to get the Phase I Heritage Loop Trail completed. Thank you Dave Rencehausen for the trail signs. Thank you State Representative Dave Greenspan for advocating for the $200,000 appropriation to move the project forward, for Mayor Clough for supporting the application and for Jim Bedell, Planning Director for taking what was supposed to be vacation time between Christmas and New Year’s to complete the successful application and for your providing many types of support to the committee. Thank you Girl Scout Carolyn Bedell, who took on the Lilly Weston as her Gold Award project to raise awareness of the importance to preserve the house through creation of a web site, television, print and social media. Most especially, thank you loyal committee members, including Jan Schmidt who takes the committee minutes, chairs events to raise money, paints windows, erects signs. Bob Myers for always being willing to help in any way you can and bringing in others to help and for allowing us to collaborate on the Car Cruises and Dave Pfister who has insight on how the committee intersects with the work of the general historical society. Dr. Lillian Boehmer, thank you in advance for co-ordinating the Mayor’s Ball in 2019 with proceeds to benefit the Lilly Weston house. Ken Coeling, thank you for being our first “Beam” donor with a donation of $1,000. I am also chair of the membership committee for the society and have membership applications with me. Dues start at just $10., most importantly membership, much like your being here today, tells others who control the purse strings that the history of the community matters to you. You can also check out the Westlake Historical Society and Lilly Weston web sites to join or make donations. We have a fund raising campaign which includes purchasing a beam for $1,000. joist for $500 and stud for $250 or you can be an honorary Weston for $100 and Lilly for $50. I also have flyers for a trolley tour of Westlake history that I will be narrating on Saturday June 23rd. Tickets are $30 and are a fundraiser for this project. Thank you again for being here it means a lot to me and members of the committee.